Excerpt: Chapter One. 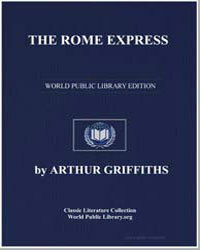 The Rome Express, the direttissimo, or most direct, was approaching Paris one morning in March, when it became known to the occupants of the sleeping?car that there was something amiss, very much amiss, in the The train was travelling the last stage, between Laroche and Paris, a run of a hundred miles without a stop. It had halted at Laroche for early breakfast, and many, if not all the passengers, had turned out. Of those in the sleeping?car, seven in number, six had been seen in the restaurant, or about the platform; the seventh, a lady, had not stirred. All had reentered their berths to sleep or doze when the train went on, but several were on the move as it neared Paris, taking their turn at the lavatory, calling for water, towels, making the usual stir of preparation as the end of a journey was at hand.